You can’t ignore them: Burger King and McDonalds. They will, no doubt, always be with us. I well remember entering the spanking new McDonalds in Grafton Street in 1977, shortly after it opened. It was bright, clean and shiny and it sold root beer, which I tried – once – ugh. Now they are everywhere, and they are quick and convenient. And sometimes a burger is what you need. Particularly when you get to the hunger stage just past the ‘I wouldn’t mind something to eat now’ stage. 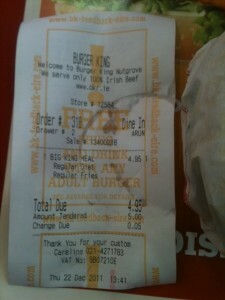 I’m not sure why, but I prefer Burger King to McDonalds. The beef in the burgers seems to taste better, although that’s probably down to salt and fat content. 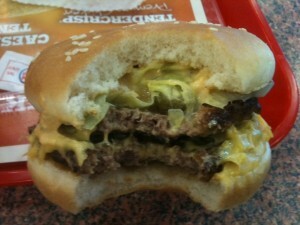 And, of course, they do the Bacon Double Cheeseburger which I like. While I love chipper chips, with their salty vinegary-ness and their end-of-the-bag soggyness, I also like burger joint fries for their thin crispy quality, and do I love it when you pull an unfeasibly long one out of the bag. I work beside Nutgrove Shopping Centre in, well, Nutgrove, between Rathfarnham and Churchtown. It’s where I do the weekly shop on Saturday mornings – early, before it fills up with ditherers. Nutgrove has a Burger King, a ‘drive-thru’ McDonalds, a Subway, a food court of sorts with outlets selling pizza slices, pretzels, rolls, paninis and the like, and an Indian restaurant which I’ve never been in. 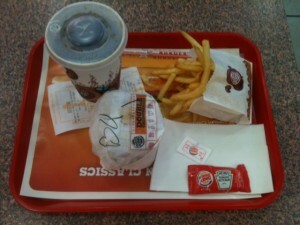 The Burger King is quite small with both tables and raised seating at counter tops. It’s usually busy and today it was particularly so with many people, like me, trying to get the Christmas food shopping out of the way before the madness of the weekend. As you see, it’s a double burger (with a choice between a BLT, a Rodeo (no, me neither …) and a Big King), small fries and a small soft drink. I went for the Big King with Diet Coke. Unlike in McDonalds where they take your order and you wait at the till until the order is filled, in (this) Burger King, once your order has been taken you step aside (while they take other orders) and wait until someone waves your tray about and shouts out what’s on it. The result seems a little chaotic but it appears to work. I took my tray, found a table and tucked in. What can I say? The thing about these places is that the food is pretty consistent. I always eat the fries first. Not sure why – it’s just what I do. They were crunchy, thin and hot – not tasting of much but that’s what you expect. The burger was quite small in diameter and comprised two beef patties, some plastic cheese, lettuce, onion and a yellow/orange sauce that was vinegary (but not too much so) and seemed to contain chopped gherkins. 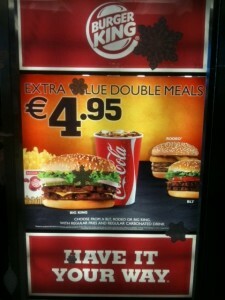 I think that sauce is the one they put in the Whopper and I’m not really a huge fan. It tastes a tiny bit like sick. I can’t think of anything more to say about this. If you’re hungry, it’s food and it’s filling and it’s cheap. It’s not fine dining. It’s not exciting. It’s not at all memorable. So, it’s almost Christmas. I like Christmas Day – the preparing, the cooking, the eating, the giving and receiving of presents, the cracker hats and so on. The rest (both before and after) I find stressful. And judging by the drawn and harried faces of many in Nutgrove today, I’m not alone. I try to eatforafiver each week but sometimes real life takes over – you know, family, paid work and so on. So last week didn’t happen. 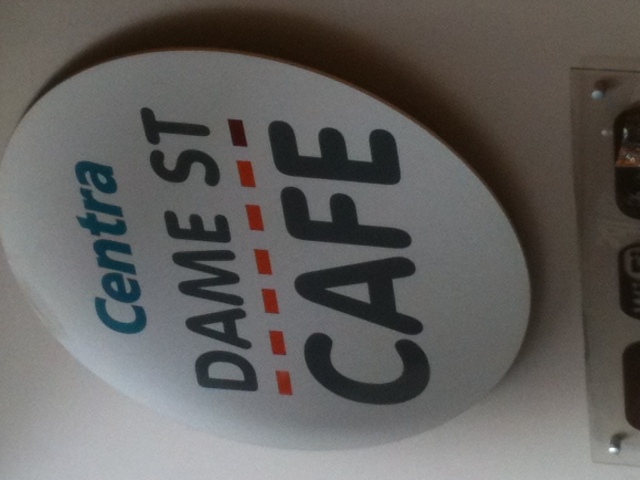 I looked around and remembered that the Centra on Dame Street, opposite South Great George’s Street had both cheap food and a seating area. So that’s where I headed. The place is rather grandly called the Dame Street Cafe. Inside it has no pretensions. Indeed, it’s a rather functional place. At the back of the convenience store part of the Centra is a longish and very busy food counter. They do the usual range of filled rolls, sandwiches, paninis, plain-looking soup and so on. But they also do quite a range of hot food, much of it for a fiver or less. Included are ten inch pizzas with a variety of toppings, quiche, lasagne, meat or veg pies, ‘gourmet’ pies and chicken or beef noodles. In fact, today, they had a special offer on noodles: chicken or beef noodles with stirfry vegetables and a choice of about six sauces, for €2.99. A pretty decent helping too, freshly prepared in front of you. They also have an all-day breakfast offer for a fiver. 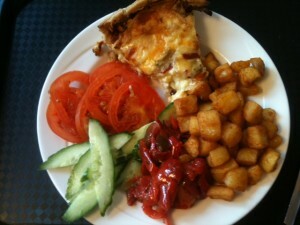 I opted for the quiche. For my fiver I received a decent slice of vegetarian quiche (the other option was bacon and spinach), three ‘dry’ salads (i.e. ones without mayonnaise) and a portion of chips, wedges or potato cubes (I chose the cubes). You take your tray, pay at the shop till and find a seat. The seating area comprises about twelve small round tables, some with chairs and others arranged in front of a banquette. When I got there, at about 1.30pm, quite a few were occupied but by the time I sat down, most were free, but not cleared (or cleaned). It’s a busy place. Most customers opt for filled rolls and there are four or five staff members behind the counter filling orders. Service is quick. My quiche slice was generous. The vegetarian bit was fulfilled by some onion and very thin slices of pepper but it was mostly a creamy eggy mix and pastry. I’m not going to write about the quality of it. It was a mass produced quiche. And it filled a gap. My salad consisted of some tomatoes, slices of cucumber and some mixed peppers in oil. All inoffensive. The potato cubes were cuboid. This isn’t fine dining, nor did I expect it to be. I did expect the quiche, having been heated, to be hot. It wasn’t. The surface was warm but the inside was cool, and not in a good way. 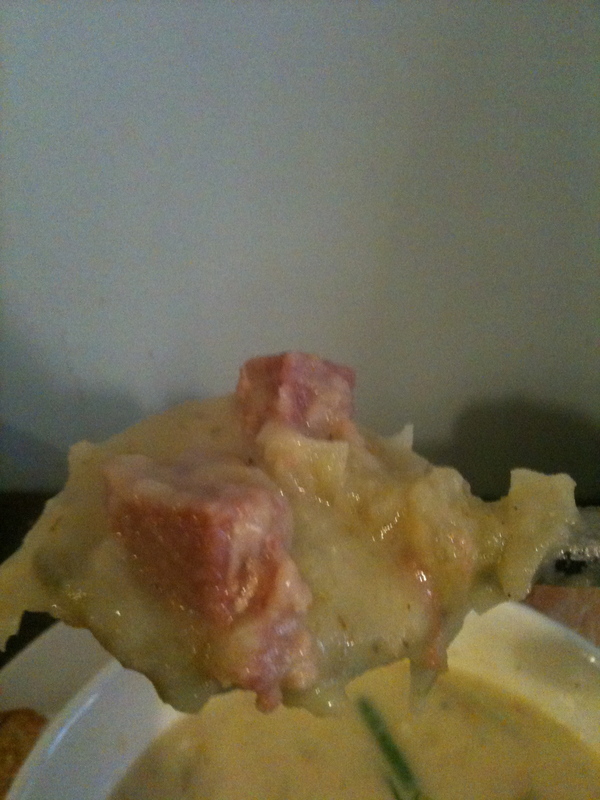 The potato cubes weren’t hot either. I’m not hugely fussy about temperature and I ate the food but I’m sure others wouldn’t. But, hey, it only cost a fiver and it was filling. And, on a bitterly cold day, I ate sitting down in a warm building. My favourite thing to do on Dame Street is to walk near the College Green end and look up. The tops of the buildings are astonishing: ornate and beautiful. Further on, I have to admit a liking for the Central Bank building. It then becomes a bit of a mess until you get to the City Hall. City Hall is a treasure both inside and out (especially when viewed from Parliament Street). There used to be a tiny park just beside it with some interesting old sculptures. It was replaced some years ago by what may be the ugliest building in Dublin. A grey anonymous piece of crap that could only have been conceived by an artistically and aesthetically bankrupt architect and given planning permission by a bunch of ethically challenged idiots. 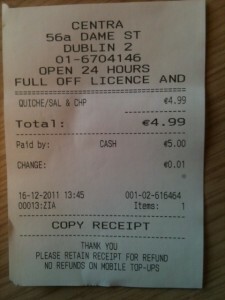 Just by the way, opposite the Dame Street Cafe is a Spar which also has a good range of food for a fiver. Not much seating but noted for a further visit. As a final note, I met an old college pal during the week and we ate in Kanum on Mespil Road. 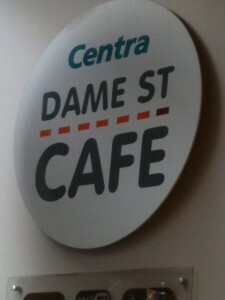 It’s primarily a take-away but they do have a reasonable seating area and a special lunch menu. There’s a few soups for a fiver. But they also do a daily special lunch deal comprising a main dish, boiled or fried rice and a bottle of sparkling or still water. 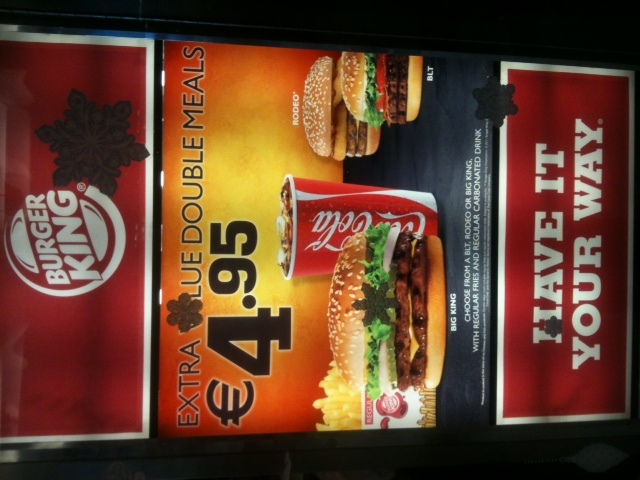 It’s for €9.99. The thing is – the portions are incredibly generous. Enough, if you’re not ravenous, to share between two on the plastic plates they supply. Jack, my godso,n tells me that Kanum also do fiver deals for those lucky enough to be students. Soup Dragon … but is soup a meal? I’ve been in two minds about this. When I started the blog, I kind of had a mental rule that I wouldn’t include soup. 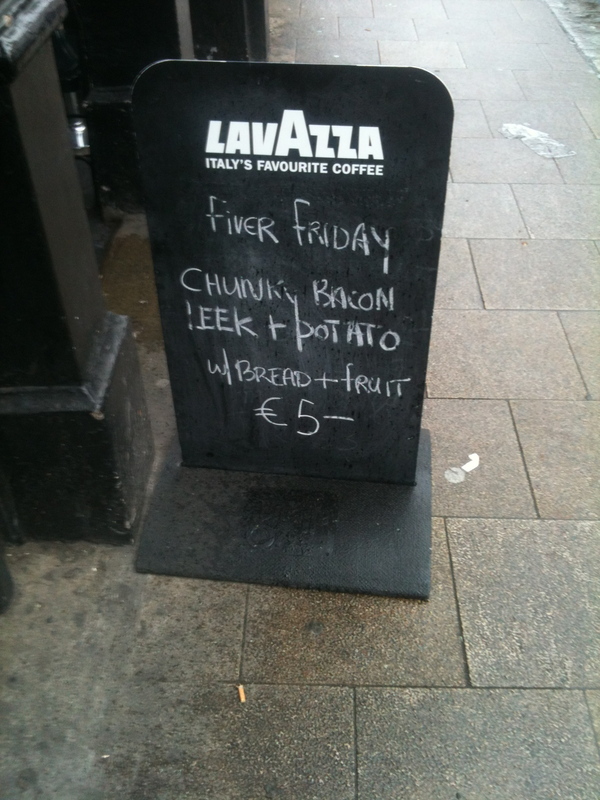 After all, it’s not much of a challenge to find soup and bread at lunchtime in Dublin for a fiver or less. Fiver Friday has a nice ring to it. 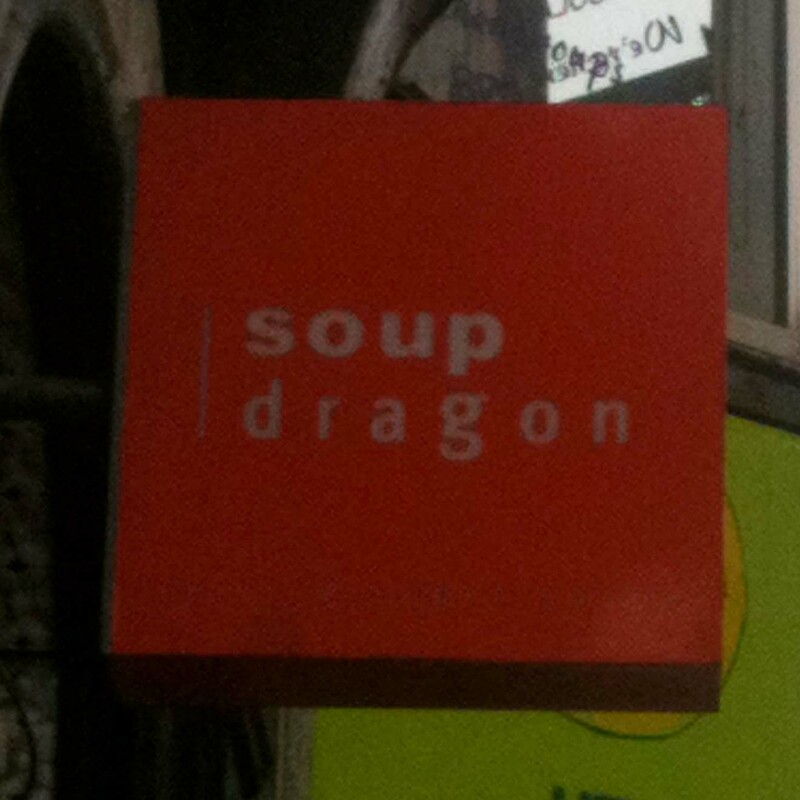 Each Friday, Soup Dragon has a special offer. As you see, it’s a soup (although the previous week it was a stew), bread and a piece of fruit for a fiver. Their Facebook page provides the details each Thursday and, of course, you can see previous offerings there too. Quite a variety. Soup Dragon is on Capel Street, at the end nearest the river. Not so long ago Capel Street was a scruffy thoroughfare, a street one had to drive along to get from Parnell Street to the south side. It’s changing now. Lenehan’s is still there, as is Brereton’s jewellery and pawn broker shop, McQuillan Tools, the martial arts equipment shop at the corner of Mary Street and a few of the more famous pubs. The discount furniture shops that used to plague the street are fewer now and there are many more restaurants on the street, mostly offering food from the far east. There also seem to be quite a few eastern European foodstores. It’s still scruffy but it’s a lot more interesting now, and (almost) a pleasure to walk along. 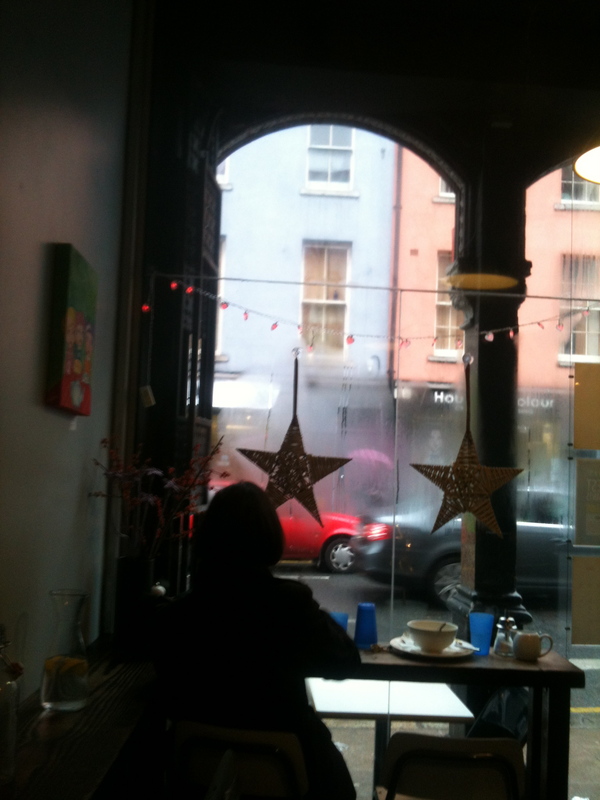 Soup Dragon is open from 8am to 4pm, Monday to Friday and from 11am on Saturday. It’s small. Very small. Most of it is taken up by the kitchen and service counter, with the seating area comprising a counter-top and about 10 seats. When I passed it the previous week, it was packed but on Friday, admittedly at 1.45pm, there were plenty of seats available. It was a bitterly cold day with stop-start rain. I ordered at the counter and sat. My soup was delivered promptly. 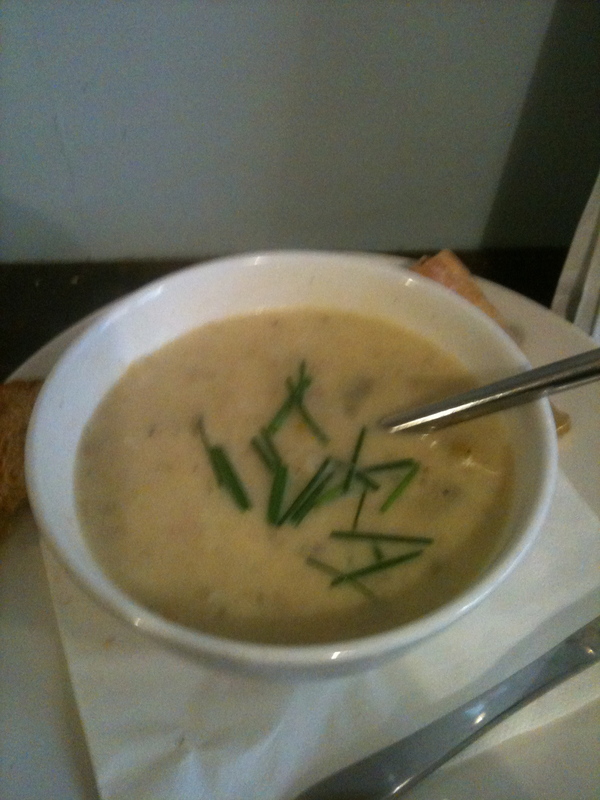 It was a big bowl of soup with fresh chives scattered on the top. On the plate were three sizeable chunks (not slices) of very fresh bread and a foil wrapped portion of butter. Jugs of water and plastic beakers are available on the counter top. 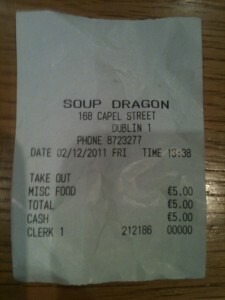 Soup Dragon is pretty busy as a take-away. In the short time I was in the place, there was a steady stream of customers, most of them ordering the other available special offer: take-away vegetable soup with a piece of fruit for €3. They are strict about not allowing take-away customers eat their food on the premises, which is fair enough. The other food on offer in Soup Dragon includes various breakfast options, sandwiches, smoothies and a huge variety of different soups. They are also taking orders for Christmas puddings. Interesting. By the way, thanks to all who sent me suggestions for places to eatforafiver. I’m looking forward to trying them out.